Defectors claim North Korean leader Kim Jong-un is nervous about leaving Pyongyang in case the unruly military stages a coup in his absence as he heads to Singapore for a summit with U.S. President Donald Trump. "Except for visiting China twice this year, Kim Jong-un has never left North Korea since taking power," a senior defector said. "And this will be the first time he leaves Pyongyang on a preset date so he is probably worried about a lot of things." Kim's daily schedule is shared only among a select few party officials, and any reports in the state media are published only after his trips or public appearances have taken place. 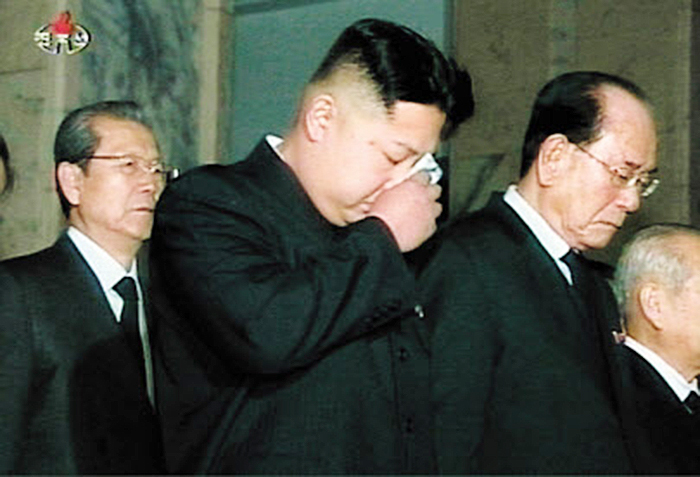 North Korean leader Kim Jong-un wipes tears during his visit to the Kumsusan Palace of the Sun in Pyongyang in this 2011 screen grab from [North] Korean Central TV . But the date of the summit in Singapore has already been announced. One source said, "If there are any factions in North Korea that are opposed to the Kim Jong-un regime, they will know exactly when to act." Already officials in the North seem to be taking steps to stem any unrest. According to Japan's Asahi Shimbun, authorities last month showed provincial Workers Party officials and state-run company heads a video of Kim shedding tears. It quoted a defector who used to be a high-ranking party official as saying, "The video appears to have been made aimed at appealing to the North Korean people about the prospect of dismantling nuclear weapons ahead of the U.S.-North Korea summit."